Need a quote for your own bespoke package? A Children's Outdoor or Indoor Cosy Den or a Little Play Shop or A Mini Play Theatre - this is a Play Den that can be all of these depending how you arrange things. 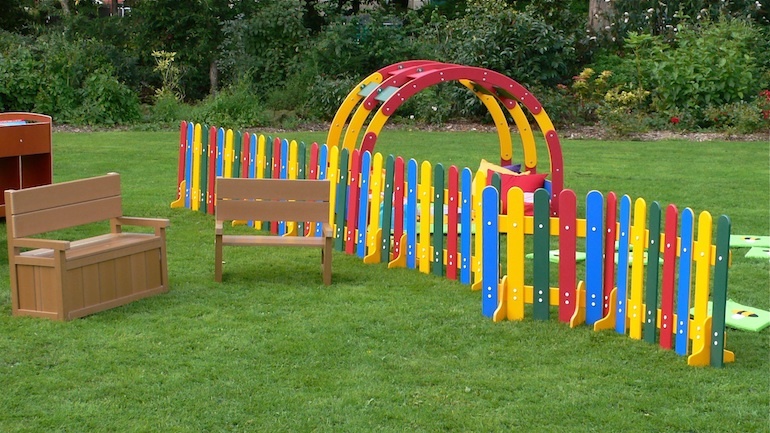 Made entirely from Recycled British Waste Plastic in attractive bright colours, UV protected against fading and totally maintenance free. 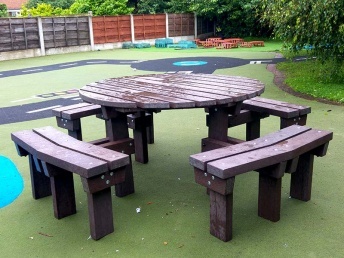 A simple, robust recycled plastic outdoor bench for school playgrounds, recreational areas, community play areas or private gardens. Does not rot, has no splinters and lasts for generations. Recycled plastic throughout. Colours are UV protected against fading in direct sunlight. Excellent value maintenance-free. Tough and made to last, does not rot, no splinters, and with UV protected colours that never need painting. It will never rot and stays looking good for decades with no maintenance other than cleaning. The Ribble benches are extremely robust recycled plastic benches, made from the type of waste plastic we all put in our recycling bins. This 4 seater garden bench is equally at home in a country park as it is in a private garden. It will never rot, never need paint and is too heavy to blow away or steal. Graffiti can be removed with WD40 and some wire wool. Park benches of this type are no maintenance and never need replacing. An 800 x 800mm garden table made from Plastic Wood manufactured out of recycled plastic from old CD cases and coat hangers. UV stable colours never need painting and unlike wooden garden tables this will never rot. Non-absorbent material easy to clean with normal household detergent. Can be left outside in all weathers, so no need to put it into storage for the winter. Impervious to water, frost, insects and mould. This is a unique table in plastic wood manufactured from crushed CD cases. Never rots, and can remain outside all the year round.